A 140 character message. It’s not a lot… and yet it is. B ios are short – make it count! Add a link to your opt-in freebie and collect sign-ups on every platform you can, including Twitter. C onnect with others in real time using a Twitter chat. Set a regular time and date where your prospects, your followers, and anyone else for that matter can connect with you and see/read your brilliance. D irect messages are a way to personally connect with a follower who also happens to be a prospect client. E xpert status can be maintained and expanded via Twitter by adding value to your followers’ feeds, linking to your content rich blog posts, answering questions in a Twitter chat…and so much more. G ive generously of the re-tweet. This is a way to share others’ content online, and stay current as well as top of mind in the busy Twitter stream. H andle is your username, pick something that is business related or as close to your own name as possible. I nvestigate influential people to add to Twitter lists. It’s a great way to keep your name in front of them! J ust follow the trends. Unsure what to Tweet about today? Follow those topics (aka hashtags) that are trending on Twitter, meaning lots of people are tweeting about them, so you stay in the flow. K eep it short and simple. If you are wordy Twitter will be a challenge. Hire your niece instead. M ention others in your tweet with an @ sign and their handle so they know you tweeted about their stuff. N otifications can help you stay on top of @mentions, RTs and Favorites that occur to your Tweets, so make sure to check the notifications tab where Twitter keeps all of this organized just for you. P rofile photos are still important here! This photo will appear next to each Tweet you post. So make sure it is professional, polished, and what you want to show. Q uestions are great for interaction and engagement. Make space (aka keep it short) to allow others to re-tweet and add their answer. R e-tweet is a re-share, giving credit to someone else’s tweet that you liked, a tweet that has value for your followers, or one that is just plain fun. S ocial Oomph is my favorite way to streamline, simplify and schedule tweets. T witter is the #1 way to reach unreachable people (think Oprah). U se hashtags (#) sparingly but wisely! They make your tweet searchable for those looking to find what you have to offer. V erified accounts are usually for famous peeps, which you might someday be! W ho should you follow? Twitter makes recommendations of interesting accounts based on your profile, but in the end refer back to Letter F above. X amine (Do you see the list of X words??) Examine your analytics. Do you send out a newsletter? Check to see how many people share it on Twitter. Do you use Google Analytics for your website? Check to see how many people are finding you from Twitter. Where do you need to step up your game? Y ou should have a Tweet button on your website so people can easily tweet your stuff! Z ero in on someone you would like to emulate on Twitter. Use their Twitter habits as a guide for your own. 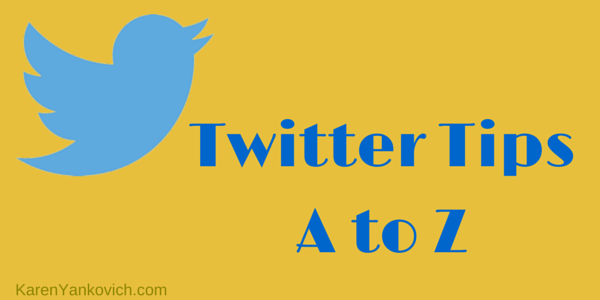 Great Twitter tips from A to Z! I like your being passionate, energetic, creative, and ever inspiring. Congratulations. Love this short and powerful list, Karen! What a clever idea for organizing and presenting your blog post. This is such a useful Twitter guide and even doing one or two of these tips can make a significant difference in one’s social media course of action. Haha! I love your comment about the X :). The tips I need to use more are hashtags and Twitter chats. I’ve participated in Twitter chats, but haven’t hosted one and I’m not in the habit of using hashtags regularly.